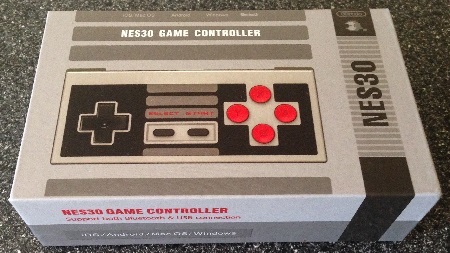 The NES30 controller by 8BITDO is a versatile controller that works well with many systems. This is a short review that briefly describes it’s features. Bluetooth Gamepad (Windows / Android): I tested this both on my laptop and my Amazon Fire TV. It seemed to work perfect on both and the lag tests verified the results: Zero lag on my laptop and both the official Fire TV Controller and the NES30 had the same exact lag on my TV (there will always be some lag when using a flat-screen TV…it’s the TV, not the controller). Something to note: As with all bluetooth controllers, you have to unpair it from one device before you use it with another. If you’re not near the device you’re paired to, you can hold down SELECT for 3 seconds and the NES30 will unpair itself. Bluetooth Keyboard: On my Windows laptop, this mode performed the same as the “bluetooth gamepad” mode (no lag). I guess this mode could be used for situations where the device you’re attaching to has issues with it in the other mode? USB Joystick: This mode allows it to work like any basic USB joystick. I tried it on both my laptop and arcade PC and it worked great. Just to double check, I once again performed the manual lag test and there was zero lag in USB mode. iCade Mode: This worked perfectly on my iPad and was compatible with all my iCade games and emulators. Also, the lag test (using the MD.EMU app) showed the exact same lag as using the touch screen controls, so clearly nothing bluetooth-related. Wii Mode: This controller can be paired with a Nintendo Wii, but you still need the Wiimote to navigate the Wii menu. I paired the NES30 as controller 1 and the Wiimote as controller 2 and was able to start New Super Mario Bros. without any problems. In the game, pressing the L&R buttons at the same time had the same effect as shaking the Wiimote, so in TNSMB, you could still do the high-jump. Sadly, I wasn’t able to get it to work with Virtual Console games or emulators at all: As soon as I launched either, the controller lost connection with the Wii and wouldn’t re-pair until I was back at the main dashboard, however they’re currently working on beta firmware to correct this. At the moment, the NES30 isn’t the best solution for the Wii, but 8BITDO seems to be pretty active with their firmware updates and I’d expect Wii support to improve. It doesn’t support the Wii U yet, but there’s talk of that being added soon as well, which would make an excellent addition to the Wii U Virtual Console games. Bluetooth Keyboard 2P: This mode is designed so you can use the controller as a second player: It maps different keyboard keys to the buttons, so the commands won’t interfere with another NES30 or iCade-compatible controller. I was able to pair this mode to my laptop and it worked fine. Unfortunately, I couldn’t get it to work with my iOS emulators (the ‘.net’ emulators): It would pair to my iOS device and I used the notes app to test the keys (they’re registered as normal keyboard presses), but none of the emulators would recognize it. Maybe this will be fixed in a future firmware update? Emu-touch screen mode: This mode requires you to manually install an app on a jailbroken iOS or Android device. I haven’t tried it yet, but I imagine it’ll work similar to blutrol. Overall, I really liked this controller and even though Wii support isn’t great (yet), I recommend it. I found myself using it more than my Fire TV controller when gaming on that device and it worked great when playing AM2r on my arcade PC. 8BITDO has a long way to go before I’d call it “perfect”, but I can honestly say this is the controller I always wished the iCade 8-Bitty would be!